In October 2016, UNESCO condemned Israel regarding its activities on the Jewish Temple Mount in Jerusalem and excluded all references to Judaism’s ties to the site. The resolution was put forward by a number of Muslim states, including: Algeria; Egypt; Lebanon; Morocco; Oman; Qatar; and Sudan. “Al-Aqsa Mosque compound is the third-holiest site in Islam. It is located in East Jerusalem, which Israel annexed following its invasion in 1967 – in a move never recognised by the international community – as part of its subsequent military occupation of the West Bank. Jewish settlers and Zionist organisations have called for complete Jewish control over the mosque compound. Jewish groups refer to the site as the “Temple Mount” and their increased incursions into the mosque compound have continuously led to Palestinian protests across the occupied West Bank, including East Jerusalem, and the Gaza Strip. “Al-Aqsa Mosque sits on the Temple Mount, which was built by the Jewish King Herod 2,000 years ago. The mosquecompound is the third-holiest site in Islam and the Temple Mount is the holiest place in Judaism. It is located in the eastern half ofEast Jerusalem, which Israel annexed following its defensive war against an attack initiated by Jordaninvasion in 1967 – neither Jordan’s annexation of Jerusalem, nor Israel’s subsequent annexation were in a move never recognised by the international community – as part of Israel’sits subsequent administrative control military occupation of the West Bank. According to the Oslo II accords signed between Israel and the Palestinian Authority in 1995, and the Peace Agreement between Israel and Jordan signed in 1994, Israel handles all security matters on the Temple Mount/ A-Aqsa compound. Non-Muslims have regular visiting hours on the Temple Mount, and some Jewish settlers and Zionist organisations have called for non-Jews to be able to pray at the site as they had done before Suleiman banned the practice roughly 500 years agocomplete Jewish control over the mosque compound.Those calls resulted in Palestinians organizing themselves against Jewish visitors. In September 2015, Israel banned the “Mourabitoun,” the group of Muslim civilian guards who were regularly harassing Jewish visitors to the holy site. That action further excited Muslims who feared that Israel sought to change the status quo, and sparked numerous Jewish groups refer to the site as the “Temple Mount” and their increased incursions into the mosque compound have continuously led to Palestinian protests across the occupied West Bank, including East Jerusalem, and the Gaza Strip. As seen above, Al Jazeera is part-and-parcel of the problem of incitement in the conflict. Qatar continues to be an active supporter of violence in the region. It is well past time to boycott Al Jazeera and its social media site AJ+. Further, Americans should demand that the United States remove its central military command in the Middle East out of Qatar (perhaps it can help stabilize Iraq by relocating it there). Distorting history is just part of the problem. Incitement must have consequences. 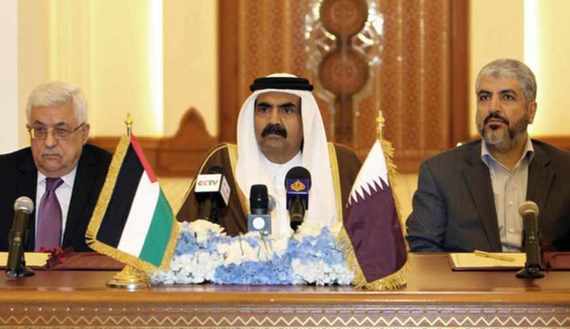 Qatari Emir Sheikh Hamad Bin Khalifa Al-Thani (C) Palestinian President Mahmoud Abbas (L) and Hamas leader Khaled Meshaal attend a ceremony in Doha, on February 6, 2012. This entry was posted in Israel and tagged Al Jazeera, Jerusalem, Qatar, Temple Mount by First.One.Through. Bookmark the permalink. its absurd and ridiculous they are attempting to rewrite History which will never happen.